Liu Shui Hua drives a car for a living in the southern Chinese province of Guangdong. He used to rent it out for 600 yuan ($91; £56) a day. Now the price is 400 yuan. "Prices of everything are high, so people want to spend less, or use the car service less frequently. It's the only way I can compete," he says. He feels squeezed. He is from Henan province in central China, and he finds Guangdong very expensive. The government raised the price of the kind of petrol he uses by 30 fen (5 US cents) a couple of months ago. It now costs about seven yuan a litre. "They've cancelled the road tax because they're getting so much more tax from the petrol," Liu Shui Hua says. "But it doesn't make much difference, the cost of living is going sky high." China's Premier Wen Jiabao told the annual meeting of the National People's Congress, the country's parliament, this week that maintaining price stability was a top priority in 2011. Despite this, all week the stock markets in China have been buoyant, partly because the Premier stressed "stability, continuity, flexibility and effectiveness" rather than signalling a further tightening of monetary policy. Chinese officials like to remind people that under the country's price laws they have the authority to intervene wherever and whenever they feel the need to try to control inflation. But Shanghai-based economist Andy Rothman of CLSA capital markets argues that they talk the talk but don't actually walk the walk. "Back in 2008 when food prices were rising about twice as fast as they are at present, they capped the price of cooking oil and the price of milk for three months," he says. "Right now as far as I'm aware the only food item whose price is being controlled is cooking oil - and that measure has only been in place for three months." Food prices helped drive up inflation in November to 5.1% - a 28-month high, but one that was largely due to a period of bad weather. The weather cleared up, the growing season for many vegetables was not so long, transport problems were eliminated, and prices have started to stabilise again. "This was nothing to do with price controls," says Mr Rothman. "The only place where the government controls the prices the consumer pays are petrol and the bills for utilities like electricity or gas." "The government has been allowing those bills to rise, so that's a good indication that it's not panicked about inflation." 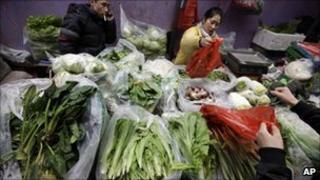 Beijing says it wants its people to earn more, to help ease the burden of rising prices. IHS Global Insight analyst Xiangfang Ren points out the country's new "Five Year Plan" sets a target of 7% for urban and rural household income growth, pretty much the same as the target for economic growth (GDP). The income growth target under the previous Five Year Plan was much more modest than the GDP target. "Some 29 Chinese provinces have announced a similar goal of achieving household income growth that is either roughly the same or faster than GDP growth in the next five years," Mr Rothman notes. "Despite only three provinces managing to do that under the last plan." We won't know for several years, though, whether or not that is achievable. Inflation is the result of high demand for goods such as food, as well as caused by rising costs. Lee Yong, a professor at the School of Economics and Finance at Tong Ji University in Shanghai, points out there are limits to what China can do to control the latter. "China has little control over the costs of commodities from abroad, such as aw materials or petrol," he says. What it can change is its industrial structure, which the professor calls "a long-term problem that will take time to solve". Many critics of China's industrial policy point to an over-reliance on investment in infrastructure to maintain economic growth. This week the government announced plans to build or renovate 10 million units of affordable housing this year and again in 2012, part of a 36-million unit programme over five years. They hope it will ease pressure on property prices, but by increasing demand for raw materials and labour it could fuel inflation too.